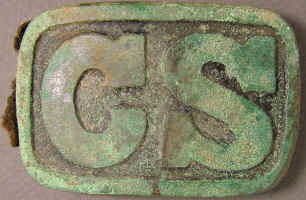 Buckle depicts "CS" and is a rectangle belt plate broadly used in the Confederacy. This style is noted for CS on a cast rectangle with wide border, and rounded corners, background is coarse and is sometimes lacquered, the plate is found predominantly in the western theater. The casting is crude, round prongs were originally cast straight up, the area around the base of the hooks was milled and spun, then the hooks bent into position. Production may have been shared with more than one manufacturers, there can be variations one casting to the next. Ref: Mullinax Expanded Edition, Plates 125 to 128. P0320...Confederate rectangle belt plate, CS, rounded corner, cast, spun hooks, Confederate wartime manufacture. 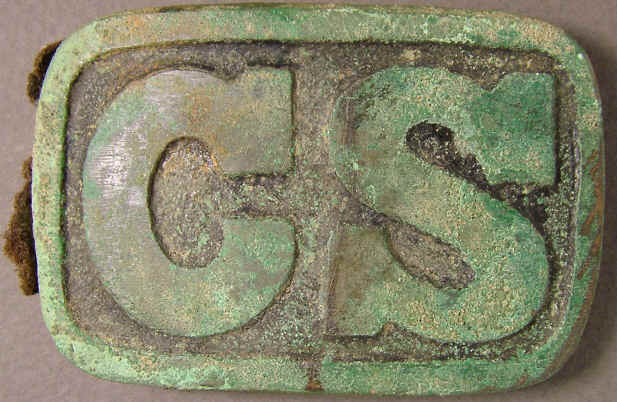 Buckle depicts "CS" and is a rectangle belt plate broadly used in the Confederacy. This style is noted for CS on a cast rectangle with wide border, and rounded corners, background is coarse and is sometimes lacquered, the plate is found predominantly in the western theater. The casting is crude, round prongs were originally cast straight up, the area around the base of the hooks was milled and spun, then the hooks bent into position. Production may have been shared with more than one manufacturers, there can be variations one casting to the next. Plate measures 46.2mm X 72mm. 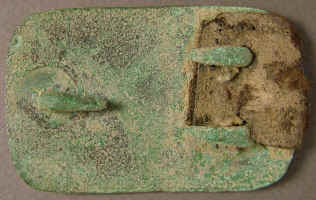 Dug plate, never cleaned, hooks intact with fragment of leather, small scrape on the face was diggers shovel. Recovered: Blakely Alabama, by Don Meacham, in the 1970's.